I love to eat beans especially the sweet type! Eating beans in salad, curry, soup... I love them anyway, but sweet simmered Japanese style beans, that's my best of best! 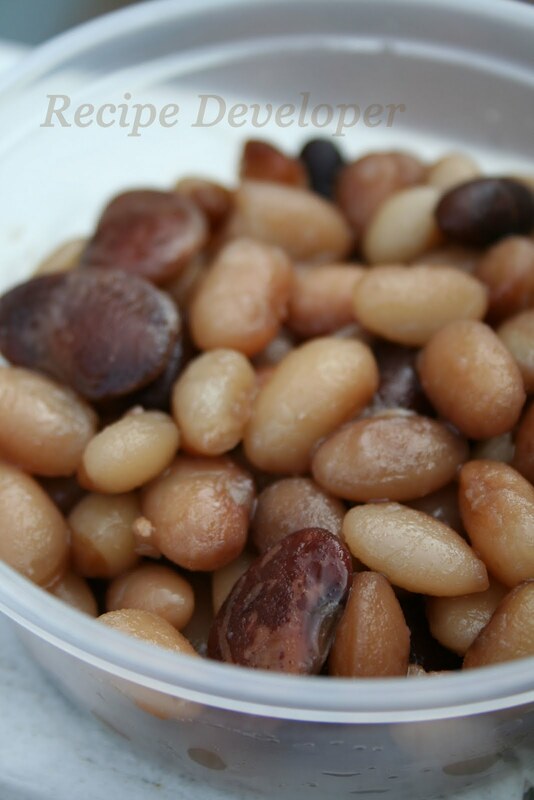 That is Ni-Mame, which means "cooked beans" in English. Cooking beans takes little longer time, but it's worth the wait. Some people may consider eating beans as a comfort food, but for myself I also enjoy the time preparing the beans just as much as eating them. All those cooking elements are part of healing process, if I may say. The first bite of the sweet taste...including all the prep time is comforting to me, every time I cook beans. I got about 1 lb. of mixed beans at Whole Foods Market the other day, and cooked everything at one time. After I cooked the beans without any extra ingredients, I divided in 3 parts, 1 for Ni-Mame and other 2 Parts for freezing. Then, I made a thin syrup with brown sugar and water, and pinch of sea salt. After it's started to boil in a pan I add all the beans and turn the heat down very, very, low and cooked for 30min. Turn the heat off and let the taste all come together as it's cooling down. In my home back in Japan, Ni-Mame is one of the best Ocha-Uke (お茶受け/ little snack or condiment for break with green tea. And I believe my mother and grand mother are having it right now.